This morning I sit here thinking about some of my bestest friends, McKenna and DJ, who are on their way to Eastern Europe to meet their newest daughter. I know I was in their shoes just months ago, but I don't think you realize the gravity of something like this until you watch from the outside in. Does that make sense? I am so excited for them and it is making me really emotional! Last night I watched a one hour special on television about Operation Smile. I sat there intently watching with tears streaming down my cheeks as my heart swelled with joy for these kids. What an amazing organization! I think know I was more deeply touched by the Operation Smile special because McKenna and DJ's soon-to-be daughter has a cleft lip and a cleft palate, in addition to having Down syndrome. I am so proud of them for giving this sweet girl a home ... she has no idea right now what God has in store for her! Can you believe that $240 is all that is costs for Operation Smile to perform a 45 minute cleft lip and/or palate surgery that will provide a lifetime of happiness for a child? I think that is just amazing! So I have vowed to help when I can ... all in honor of McKenna and DJ's newest daughter. It feels so good to be able to help and give back. Anyone care to join me? Oh I know I have tears reading your post, I have a child with a bilateral Cleft Lip and Palate so this is all so close to my heart. It took me years to be able to view, the tapes from Operation Smile, a bit hard when your child has or is about to have the same surgery. I thought McKenna and DJ must be on their way by now. I sent her a message through Downsyn, not expecting them to receive it, but I couldn’t stand not to send some well wishes on. I am a member of her Private blog but cant seem to log in from my mums computer. Only a few days, till I’m home and can catch up with them. 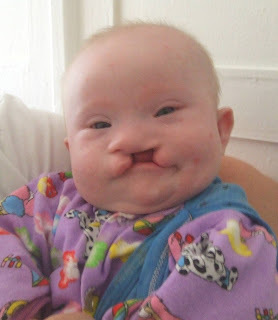 So many children with Clefts are left to die or are aborted for not being perfect, brakes my heart, And to think all it is, is some skin missing! Sorry I’m getting myself all worked up and this post is about how wonderful these parents are for searching across the world to find their perfect daughter. Love and Hugs to them. I have friends who are adopting a child with a cleft from Russia. They have just returned from their first trip. I found your blog through your interview at 5 Minutes for Special Needs and I'm in LOVE with your kids!! I'm also a mom of a T21 Angel named Henry and I'm just so amazed and thrilled with the work you and others are doing to rescue other T21 angels in other countries and bring them to their forever families! What an amazing, miraculous thing! Thank you for sharing your story and the stories of others like you. I'm so, so glad that there are places for these precious children to go!